You need understand the meaning of Galaxy S5 new features so that you can use Galaxy S5 effectively. Samsung Galaxy S5 is one of the most exciting devices for the year 2014. But is Galaxy S5 a right phone for you? Unlike Galaxy S4 which packs so many half-baked features, Galaxy S5 focused on user experience. Most new features in Galaxy S5 are apparently well polished. It is probably the best update of Galaxy S series. For the good and bad things of Samsung Galaxy S5 features and specifications, we explained them briefly in this post. In this page, I will share with you the details of top 10 features that make Galaxy S5 unique. Each feature will be explained in an individual page so that we can cover them with some technical details. Hopefully, this Samsung Galaxy S5 features explained page will serve you as a buyer guide. It will help you to decide whether Galaxy S5 is a right phone for you. Autofocus is not new for camera sensors. What makes Galaxy S5 camera different is the fast auto focus. How fast can it be? 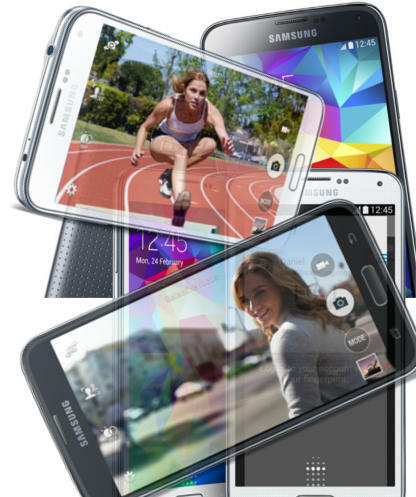 What are the technologies behind the Galaxy S5 fast fous? Why it is relevant to you? This Galaxy S5 features explained page will explain to you the details of Galaxy S5 Fast Auto Focus feature. Of course, we may add more Galaxy S5 features if needed. If you have any suggestions on topics, please let us know in the comment box below. To know more about Samsung Galaxy S5, please check our Samsung Galaxy S5 Online manual and blog posts. well i bought a phone from saudi arabia there is no settings and selective focus option in my phone,can u just tell me what to do now? By default, once you open camera app, in the left side, the second button is selective focus. Are you in easy mode? If so, switching to standard mode will will you this feature. Don’t move you finger when you tap and hold the message. Also, you can try to tap and hold blank area of the message. Can you tell me, what are the uses of multipurpose jack of galaxy s5? Can i use it to connect a projector? It can be used as USB port, charging port, MHL port. Of course, you can connect your s5 to a projector. But you need an adapter (micro USB MHL to vga). It should cost you less than $20. If your projector also supports HDMI input, you can also use a MHL adapter. This one is usually more expensive. But you can also use it to connect your s5 to a TV. Ho il Samsung S5 ma ogni volta che provo a fare il download booster mi dà questo messaggio: download booster disabilitato, esiste un modo per cercare di riabilitarlo? Spread two fingers apart on the screen to zoom in, and pinch to zoom out. The camera icon in the lock screen is available when your screen security is set to swipe. Then you can find the option in Settings–lock screen. No, if you change the back cover of your s5, for example, using some s view cover, you will lose the water resistant feature. Not sure about your question. If the WiFi network turns off when you open an app, then you cannot use the WiFi. Of course, this is not normal. By default, WiFi turns off after screen is locked (and no running processes that require internet connection). Can you tell me when will the galaxy s6 smartphone be launched?? I am not having download booster button in my s5 notification panel nor in any settings…!! Plz help me find that…! That means the download booster is not available for that model. This could be due to one of the two possible reasons : 1. No 4g let in the phone; or 2. The carrier removed it. S5 is only water resistant, not water proof. You need check the specifications for your model, although almost all s5 (SM G900 series) has this feature. Can I send group message ( >20) in samsung S5? I think the limit is 10. Some carriers have even lower limit or don’t support group messaging. How can I transfer music that I have on my PC to my phone so I can add it to a playlist?? Connect your S5 with your PC using an USB cable, then you copy the files to the phone. Do I need to turn on something on my phone to get my PC to recognize my phone? If the phone is not recognized, you can install Samsung kies 3 on your pc (not kies 2),which includes necessary drivers fire pc. Which would be the best app to work with s health and gear fit to help manage my medications peak flow, oxygen saturation and bp (entered manually or bluetooth) without needing different apps for each one. need to log measurements and compare graphs including times of doses and before and after readings against activity over time….its difficult have respiratory and mobility issues while needing to monitor effectiveness of new respiratory meds. Why don’t you just have s voice without the Internet. . ..? It needs some processing and it’s almost impossible to put the database on a phone. Settings–Multi Window. Drag it to right to enable it. Make sure you are not in easy mode. Settings–Easy mode, check Standard mode. Is the samsung galaxy s5 water resistant without the multipurpose jack protector? No, you must put on the multipurpose jack (aka USB port) protector to achieve water resistant. Kids mode keep up popping up. Can not uninstall it. Where do i delete it on usb to Pc. Settings–Applications manager. Tap Kids mode, tap uninstall. Not waterproof. it is not designed to be used in rain or under water (screen will not so responsive unless you change the touch sensitivity). it is a kind of protection. If you happen to be caught in a rain, s5 may be not damaged., but s4 will very likely be damaged. My wife has somehow gotten her s5 stuck in kids mode. She claims she was never prompted to setup a pin or alternate password, which kids mode asks for in order to exit. How do we exit kids mode without either? Boot the phone into safe mode (when the phone reboots, press and hold volume up button until it finishes the rebooting). In safe mode, you can uninstall the kids mode. Then reboot the phone normal way. If you need kids mode, you can add the widget to home screen. Tap the widget to finish the installation and setup. You have to create a PIN (4-digit) during the setup. In most regions, alternative password must also be created. You can turn off review pics/videos in camera settings. In camera app, tap settings icon, scroll down, make sure review pics/videos is off. Like samsung galaxy beam there is a feature in samsung galaxy s5 for built in projector?? No, as I know. A projector needs lens and there’s no space for them in s5. S5 and some other galaxy devices support screen mirroring to tv through Miracast. Of course, this requires a Miracast supported tv or a Miracast adapter. my google search widget, disappeared… how do i get it back?? It’s a normal widget. You can add it to the home screen just as other widget. You can go to app drawer (the 16 dots), switch to widget, tap and hold the Google search widget . when i open an email it goes to a blank screen, after it tries to open… then i have to open mail again for it to open…. was not doing this before… whats up??? You need reboot the phone into safe mode, uninstall kids mode, then reboot, as shown in this guide. You can try to clear cache for this app (settings–application manager– All -S Health). You can also try to reboot the phone to see whether it helps. If your data are synced with Samsung server, you can also tap clear data. Thanks, before I could read this message I just deleted aap and reloaded that seemed to fix the prob but thanks for helping! I am wondering if in order to use the pedometer on S Health if I need to wear my phone on an arm band or keep it in my pocket or how I need to wear it to keep accurate steps.